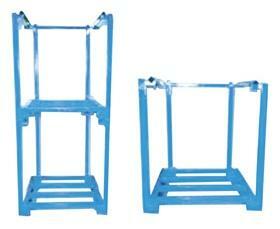 Add to the efficiency of your stock rotation with these cost-effective stacking rack carts. 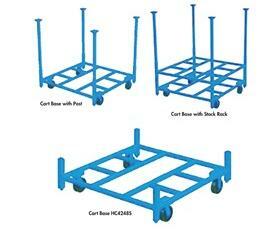 May be used to move standard base/post (see <EM>Portable Stacking Racks</EM>) about or insert posts in corners for rack with casters.&nbsp;Unit has 2 swivel with brake casters and 2 rigid casters. Available in your choice of 2,000 lb.and 4,000 lb.capacity models. 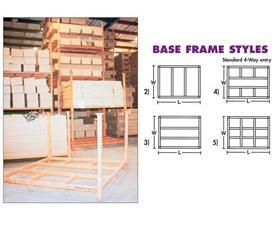 <STRONG>Call for other sizes.</STRONG> <B>Price is for cart base only &amp; does not include posts. </B>FOB Shipping Point.<BR><BR>Standard Color - Blue. These racks hold 4,000 lbs. per rack when stacked 4 racks high. Sturdy solid one piece, all-steel construction. Increase storage capacity and efficiency. FOB Shipping Point. <BR><BR>Standard Color Blue. Other colors available for an extra charge.